So, Bad Lands is Kickstarting and moving right along, and while that’s going I wanted to start planning out the beasts as a new faction for Blackwater Gulch. What I’m planning to do is a small expansion book, probably 20-30 pages tops, and it would be a print-on-demand book for hopefully relatively cheap, plus a stripped down PDF for free. Some day I would like to do a big retail release with an expanded BWG 2.0 rulebook, but for that I would rather wait until at least 3 factions are done (humans, beasts, undead) and that’s quite a ways away. So I figured the small expansion book would be a better way to go for now. As far as the rules go, forming a beast pack is pretty much the same as a human gang. Pick a big nasty boss monster to lead your pack, add in a couple of fiends (like professionals) and at least 1 minion per fiend (like henchmen). Each animal aspect has a different ability, which is basically treated like weapons for humans. But, since most of them won’t need Ranged Combat, they will have those points spent elsewhere, usually for quickness, stamina and melee combat. I have the art from Bad Lands and that will be used as concept art for the minis. Since I also already have a lot of human minis, I’ll be focusing on the beasts first, though I do plan to do minis for the Bad Lands heroes since they are all new members for each gang, but at the moment I can’t afford the amount of sculpts needed to do everything all at once for a proper retail release. I’m looking at around $800-1000 per figure for my costs (for the sculpt, print, molds, pro-painting, etc), so I will have to take it slow. I don’t really plan to do a Kickstarter for minis again, so when they’re ready they’ll just be available on my online store maybe with a pre-order sale to get an idea of how many copies I’ll need to make. 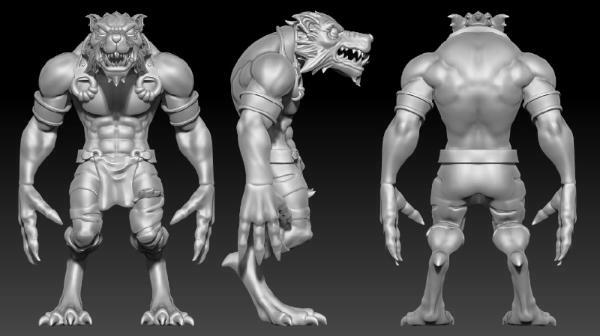 I’m going to look into getting the sculpt done for the Alpha Werewolf first, I think that’s a model that would sell pretty good even to folks who just want a cool werewolf model for other games. I’m thinking of having the Alpha / Boss monsters all larger than men, on 40mm bases, but the regular beasts and minions will be on the usual 30mm bases, but I haven’t decided yet. Sculpting is underway on the first new mini, the Alpha Werewolf. I hope to have some screenshots soon. Maybe a week or so. Pretty good looking so far. I’m planning out the rules and how to build beast packs and undead hordes, also trying to decide if I should do separate mini-expansion books for each race, kinda like a codex & bestiary in one? Or one big book with both? The human info is all in the main rules, so I don’t think they need an extra book of their own. They will both have 3 character levels, like for humans, we have Henchmen, Professionals and Heroes. For Beasts we'll have Minions, Fiends and Monsters. Beasts will all be animal-releated creatures, not just Skinwalkers. For undead we have Servants, Disciples and Elders. Undead won’t all really be undead things, so I’m also trying to decide if they need a different name. They will primarily be zombies, ghouls and wendigo (savagey vampires), but will also include witches and really any folklore creature that’s “creepy” and not an animal. And rather than straight up brain eating zombies I want to go for a kind of voodoo feel where it’s more like people who are being controlled by someone mean, but they’ve been like that for a while and there’s no going back. They still want to eat brains, they just aren’t quite dead yet. For the starter sets, I’m planning on having 6 models rather than 5. The Fame points will come out to be the same though. It’s mostly because they won’t really have any weapons to add to their points the way humans do. So each will have 1 monster/elder, 2 fiends/disciples and 3 minions/servants. I’ll be starting with the werwolf pack that will include 1 Alpha Werewolf, 2 Werewolves and 3 Chupacabras. Then I’ll do the Wendigo undead pack that will be 1 Wendigo, 2 Ghouls and 3 zombies, then I’ll start adding to each faction and start doing more human sculpts too, I just thought it would be good to get both of the new factions started first. So that’s where we’re at now. I’ll be working on the rules on the side while I’m working on Bad Lands. They’ll be playtest rules for a while, at least until I can get enough miniatures done for a worthwhile retail release, and that could take a while. These are good news. If it will help, I will wait for the campaign. But I put them up now because I know some folks aren't into Kickstarter or just don't want to wait. It might be a bit of a wait anyway though, since I just found out Game Salute is moving to a new warehouse this and next week, so they won't be able to ship out any orders until March 6. I'm gonna wait till next wednesday or so before I make the announcements around the web, so if folks see it and want to place an order they won't have to wait as long. I’m starting to work out the playtest rules for the Beast faction now. I’m hoping to have a PDF done soon, but here’s some notes. There are no beast characters, but there will be some unique monsters. Generally, a Minion will be a henchman level beast, Fiend will be a Professional level and Monster will be Hero/gang leader level. There will be a special set of skills to choose from, like the humans. Some skills will be shared, like Run & Gun for example, but there will be a lot of unique ones. Minions are mostly just animals and attack with teeth, claws or horns, but some Fiends and Monsters may use primitive weapons like bows or melee weapons. Wolf: +1 Intellect. Throat Ripper - Special attack that can be performed once per activation. Adds +1D6 to your to hit roll and +1 Strength. Enemies taken out of action from this attack cannot be revived. Bear: +1 Strength. Pummel - in melee combat, every roll of 6 to hit lowers his target's DP by 1 for this attack. Bats: +1 Stamina. Radar Sense - Werebats are always to see what's going on around them, preventing enemies from receiving a bonus when attacking them from behind. Cats: +1 Quickness. Nine Lives - If a Werecat is taken out of action, it may make an additional bonus saving throw using it's Stamina instead of Defense Points, and stand back up if the new save is passed. Even though it may have “Nine" lives, this bonus save can only be performed once per game. Bugs: +1 Quickness. Dark Omen - Count all werebugs as 2 models for the purposes of outnumbering in enemy morale tests. Rats: +1 Intellect. Sneaky - Wererats roll +1D6 To Hit bonus when attacking enemies from behind. Bison: +1 Strength. Trample - Run in a straight line. Any Hero in the path of the beast or its personal space will take 1 melee hit with a strength equal to the amount of inches traveled. Crocodile: +1 Stamina. Death Roll - Treat like a 2-handed melee attack with +2 Strength. If an enemy is wounded from a Death Roll, but taken not out of action, it will be unable to leave melee combat. May be performed once per activation. I’m still working out the special rules for the undead faction, but I think I want to focus on getting the beast rules more or less done first. So, I’ve been really torn over this whole thing for a while now, I’ve been wanting to do a weird/horror west expansion for Blackwater Gulch pretty much since the beginning, but right now the game is more or less historical and I’m starting to think I should keep it that way, from a brand perspective. I do still intend to do new models for each gang, and new gangs from scratch. The rules work good, folks like em, so I’m thinking that if it ain’t broke I shouldn’t fix it. Rather than doing a weird west expansion, perhaps it would be best to brand that as a separate game, but still keep both compatible and the rules would be similar, and I’d give it the Bad Lands name. The board game has been postponed until I can get sculpts done and have that be a game that comes with plastic minis, so developing skirmish rules first and releasing metal minis as we go would probably be a better way to go forward. I hope to have new sculpts fund the next ones on the list and keep adding new models in slowly, rather than going for an expensive splash release or a kickstarter. The new rules would remain as a free PDF for a while, like an ongoing public playtest and living rulebook. I wouldn’t offer a printed version until I’m happy that they’re “done” and I have a few different factions available, and I’d still have a free PDF version forever too. The gameplay would be mostly like Mechadrome, which is mostly like BWG, only your stamina = how many actions you get and quickness = how many inches you can move in 1 action. Each faction will still have 3 different character levels, like now. One other difference I’d like to have is less of an emphasis on using pre-made characters, instead you’ll create your gang from scratch using different class or monster types, and fixed stat lines, and you can name them yourself. I’d still have some pre-made roster sheets or character cards you can download though. And the gang size will be the same, aiming for around 5-10 models tops. I already started working on the rules, I should have them available in the next few weeks. Anyway, that’s where I’m at now. I thought separating them into 2 different product lines would be a better way to go and avoid any confusion, or turn people away that wanted more of a historical setting for BWG. I’m planning to start doing resin terrain/building kits too eventually, and those would work for both games But I probably won’t be ready to start on the terrain until around this fall. So right now we're working on the Werewolf minis, and the Chupacabras. My goal is to have the Bad Lands skirmish rules done in time to have that ready to go when the minis are for sale, with instructions on how to use your BWG minis in the game. Then I'll probably have to switch gears and get the new Mechadrome heavy mech campaign done, and then back to more beasts after that The BWG gangs will make up the human faction at first, until we're able to start doing new sculpts for them too. I want to focus on getting the beast and undead factions up and running first, but I plan to add in a few hired gun types here and there. I have to admit, I prefer an expansion (even if it were to include the base rules so it could be sold as a stand alone) rather than a separate game/product line. Folks only interested in 'historical' Wild West gaming can easily skip using the supernatural critters. Yeah that's true. I'm going to be starting it out that way anyhow, just some additional playtest rules to go with the new minis as I make them. I'd like to eventually do an all new rulebook with everything all in 1 place, so that got me thinking that it might be cool to do it as an all new game. But I'll see how it goes. Maybe a big BWG 2.0 book would be better? I would rather a BWG 2.0 with Weird West chapter than a separate rule set. What I'd like to do is have all of the new rules be free PDFs and a print on demand book for people that want a physical copy. I've been getting some print estimates though and was kind of surprised that a hardback book is only slightly more expensive than softcover, so I think what I may do is plan to do a KS campaign probably early next year just to get a limited hardback book printed. 8.5x11 and 124 pages with 500 copies made would be in the $35-40 range. The current rules are 80 pages and half sized, so it's more like 40 full pages. Would be plenty of room for updated rules, extra fluff and artwork and a nice mini-codex for each of the 3 factions. So I thought I could do a small campaign to get a nice book done and let folks add in minis if they want to as well, and just print enough to cover the pledges and a few extras, and then do the print on demand soft cover after they're gone. I am a big fan of hard copy books. I tend to prefer soft cover for rule books but would support a KS for a hardcover. Warmachine/Hordes does a good job of having two different, but completely compatible brands. It's not a bad idea. The only downside is having two different rulebooks if you want everything, but that's easy to resolve by combining them into one rulebook. Yep that's kind of what I was thinking, a warmachine / hordes kind of thing. But, thinking about that more, I would probably need a much bigger product line to support something like that, so it might be better to just keep things all in 1. And yeah I prefer softcovers too, I thought a KS campaign would be fun and a good way to produce a small limited edition hardcover book. I want to use KS more for smaller projects that will be easy to fulfill rather than great big campaigns that can easily spiral out of control. Like the Mechadrome campaign for the heavy mech and just a couple extra things that I'll be doing this summer. I think for a 2.0 book I'd do the hardcover campaign, and then once those are all sold out afterwards, I think I'd do print-on-demand digest-sized softcover with just the rules, plus a mini-codex kind of booklet for each race. I have a big (not digest sized) soft cover with a 2011 copyright date I think was your first hard copy release. How much different is the digest size version? The original book is still the current book, that's a little smaller than official digest size which is 5.5x8.5. We originally wanted the book to be small enough to fit inside of a starter set box, but we never ended up packaging it that way. We still have a lot of the original book left, so I won't be updating that to the digest size unless we run out. It wouldn't be any new content, just enlarging the pages slightly to fit. I was referring to BWG2.0 in my last post. I was imagining we'd start with the special edition hardback that has the rules plus special chapters for each race, when that's all gone I thought I could switch a smaller digest sized book that's just the rules and separate mini books for each race, to keep the costs down since print on demand books tend to be more expensive. Mine is 8.5 x 11 inches, I think it was from a Print on Demand service like Lulu maybe. Oh.. that's the really old book. It still works if you want to hang onto it and wait a while, it's not like there are any grand tournaments coming up or anything the $10 small sized book has some updates to it, mostly about gang creation and equipment and some fluff. Or you could use the PDF rules that are online now. BWG 2.0 wouldn't be happening until next year at least. I'm planning to release a few of the monster sculpts ahead of time with PDF playtest rules to get folks started, but then I'll be switching gears and going back to Mechadrome over the summer. So right now I'm planning the Mechadrome heavy mech campaign for around August, and then the BWG campaign would be around Jan/Feb next year, but I'll still be releasing other smaller things inbetween, mostly just going to use KS for things that are too expensive for me to start on my own. I found out that my 3D printer hasn’t started on the new werewolf models and there’s about a 2 week wait at this point since he’s swamped. Not a huge deal but that’s going to push things back more than expected. I was planning to get more beast sculpts done first, but I’m starting to wonder if I should just go with the werewolf pack, then move right on to the undead? So we have the Werewolf Pack, and that has an Alpha Werewolf, 2 normal Werewolves and 3 Chupacabras. The Wendingo Coven would have an Ancient Wendigo, 2 normal Wendigos and 3 Zombies. And then going forward I’d release new models separately, maybe a pack of 3 jackalopes, followed by 3 ghouls, followed by a human hunter character, some werebears, etc. Then I’d have the PDF expansion rules cover both factions rather than just doing the beasts first and waiting a while and doing the undead later. Doing it this way would probably push the 2.0 book back farther, since I’d want to make sure I can have a lot more models plus color art done to show off in the book and make it look nice, but I think it will be the easiest way to get all of the rules out there. I was originally planning to do 3-4 different were-things plus 3-4 different minions to go with them first, and start the undead after that, but I figured this would be a better way to get more variety going sooner. On a completely different topic than Badlands: At one point I remember seeing the art/background for reinforcements (on the old site's blog) for some of the existing gangs. Will these ever go anywhere? Kinda like how the Zarconis showed up in lore & art but have been AWOL ever since. If you had the blog up & running at the website then you could cross-post there & maybe get some more eyeballs. I'm not sure how many people dive into the Dakka forums for BWGulch news. Just had another thought.. would it be worth it to do a bunch of small Kickstarters for the new models, more or less pre-order campaigns? So around June or however long it takes to get masters made and painted, we do a Savage Beasts kickstarter, like a short 2-week campaign, to order the Werewolf pack. It would have just 1 pledge level for the werewolf starter pack (and you can add on our current gangs too), maybe including a printed digest sized book with the beast rules. I’d plan to deliver in August or September. The funding goal would be fairly low, under $1000 since I’ve already paid for the sculpts and all. I’d include stretch goals for the other beasts and some new men to hunt them, but I’d need to get at least $3000 per stretch goal for new models though, and stretch goals would all have to be “wave 2” deliveries that get delivered later on, probably november or december. But, I still want to plan the Mechadrome heavy mech KS for August .. would it be bad form to do that before the beast minis are delivered, even though it’s 2 separate games? After that, when the beasts are all sent out and the new sculpts done, I’d do another mini campaign for the Ravenous Dead, followed by another small one for mechadrome, and keep switching back and forth like that between games, doing mini-campaigns for a couple things that are easy to fulfill rather than big ones that drag on forever? Just thinking rather than doing a regular pre order in my online store, a KS would get more exposure. I don’t think it would hit all of the stretch goals, but even just getting the mold and production costs paid up front would be a big help for me. Ed from Two Hour Wargames has run several small KS projects to get a rule set printed and/or a handful of figures made. It seemed to work for him, and what you are proposing seems close to what he has done. I would contact him to get his perspective on the good/bad of small projects. He is a great guy. Cool I'll look him up. The mechadrome campaign is going to be more important IMO, it's going to be a bigger project just because the heavy mech will be big model. But I thought I could easily do a bunch of mini-campaigns, probably every 3-4 months going forward, and since the werewolves are almost done I could start off with that. So, I’m hoping to have the Chupacabra 3D sculpts done this week if all goes well, then they will be off to the printer. I have the Savage Beast rules PDF almost done and will be releasing that around the web hopefully tonight if not tomorrow. I do have plenty of other beasts on deck for stretch goals, but the main goal is to get the wolves done. Those will ship out pretty quick, but stretch goals will all have to be sent later as 2nd wave since nothing else has been sculpted yet. I’m planning to just have 3 pledge levels ..
$1 basic pledge to add on whatever you want. $25 gets you the werewolf starter pack (1 Alpha Werewolf, 2 Werewolves and 3 Chupacabras) or any other beast starter pack that gets unlocked later. $50 gets you the werewolf starter, 1 human gang starter set, 1 rulebook and 1 Savage Beasts book. Kind of wondering if I should not include the books and just have them be add-ons? Just thinking a lot of folks who would be backing probably already have the rulebook so why make them get another? Maybe just not have the $50 pledge at all? Most folks know how to increase their pledge if they want add-ons. For add-on items, we’ll have all of the original models at the prices the are now. The savage beasts book will be $10 (it’s a print on demand book so it costs a little more to make, but I don’t want to have to print 1000 copies if I don’t need to). Beast packs will be $25. Separately you can get 3 Minions (cupacabras, jackalopes, etc) for $12, 2 Fiends (basic were-things) for $10, or 1 Monster (Alpha were-thing) for $6. We’ll also have 2 new human professions/hired guns, Monster Hunters and Preachers, those will be $6 each if they get unlocked. So I’m hoping that will make for a good template for quick & easy campaigns I’d rather do a bunch of small campaigns back to back that are easy to fulfill rather than one big one that drags on and on, so I think this will be a better way to go. I do like the 50$ pledge level idea, but I see what you mean with the rulebook. Maybe some pre existing hired guns of the backer's choice (like 2-3) instead of the rulebook? I could try something like that. I do want to try and keep it as easy as possible for the warehouse guys though. So, maybe I'll just keep it as the 2-player starter set kind of pledge, and then folks that don't want the rulebook can just do the lower pledge and add on the add-ons they want. But then, I'm going to use my online store for the pledge manager and people's pledge amounts will become store credit, that worked well for the Mechadrome campaign. So folks could technically pick anything they want out of a $50 pledge, and just pay the difference via paypal if they go over.